The following are general instructions for adding and editing content within content prototypes provide by College of the Environment Marketing and Communications. More detailed support documentation for WordPress is available on the WordPress website. Visit your content prototype using the url provided by the Marketing and Communications team. Click on the staff login link at the bottom of the page. From the dashboard, click on News. At the Dashboard, click on the “News” tab on the left side of the page. This will take you to the full list of news posts on your website. To edit an existing news post, click on its title. To add a new news post, click “Add News”. The news page always displays posts in reverse chronological order, with the most recent news post shown first. Story source: Adds a link to an external website. Enter the full url of the source page you want to link to in the “Story Link URL” field (e.g., http://environment.uw.edu/news/a-story-title) and the text for the link in the “Story Link Text” field (e.g., Read more at the College of the Environment.) WordPress will add a link to the bottom of the news story. On the right side of the editing page, you’ll see a box with “Categories” (or topics, locations, etc.) that relate to your news posts. Check the appropriate category to assign it to the news item. Be careful while using the “+ Add New Category” to add new categories – categories should be permanent and used on many posts. This image is the primary image related to your news post. If the post is featured on the homepage, this is the picture that will be displayed. 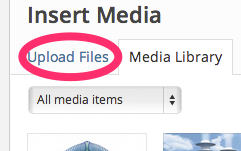 Clicking “Set Featured Image” will open the WordPress media panel, where you can select or upload images. More about the media panel below. To mark a news post as featured, add the category called “Featured” (figure 1) and be sure the news post has a featured image (figure 2). Please note that only the most recent featured story will display on the home page. If you want to feature an older story, please remove the “Featured” category from all news posts published after the story you want displayed. Click this link on the admin bar to edit the page you are viewing. Click on the Pages tab on the left, and either “Add Page” or choose a page in the list and click “edit”. When logged in to WordPress, you can also browse the site and edit any page by clicking “Edit Page” in the top navigation bar. Pages are displayed in the dashboard in a specific order and hierarchy and can be reordered by clicking and dragging. Changing the order will also change the order in site navigation. Pages are also nested in a specific hierarchy, with sub-pages and sections nested inside their parents. Page hierarchy is displayed using hyphens before the page title, with one hyphen used for each level. For example, “- My Page” is one level down, while “– My Page” is two. You can also set page hierarchy while editing a page by selecting a “Parent” under Page Attributes in the right column of the editing view. Important: When adding or reordering pages, please note that any page marked “show this page in main menu” that does not have a parent will display in your main navigation bar. Faculty profiles are in another content type called “Faculty”. Faculty content has its own set of special fields that cover publications, CV’s, and contact information. Faculty images will default to a placeholder if none is selected. Faculty are always sorted alphabetically by last name. This box selects the text style. If this is your first time editing, or the style selection box isn’t showing, click on the button “Show/Hide Kitchen Sink” for a fuller set of formatting tools.“Show/Hide Kitchen Sink” is the last button of the first row of buttons on the screenshot to the right. When in the “Edit News” view, you will see a dropdown menu that usually says “Paragraph,” the default type of text (this text is styled as a paragraph) click on it to view different styles. Select a style: Heading 1 is used on page titles, so no need to use it (ever!). Heading 2 is most commonly used for sub-titles, and heading 3 works for sub-sub titles. The page you are reading now uses Heading 2 for sub-headings. 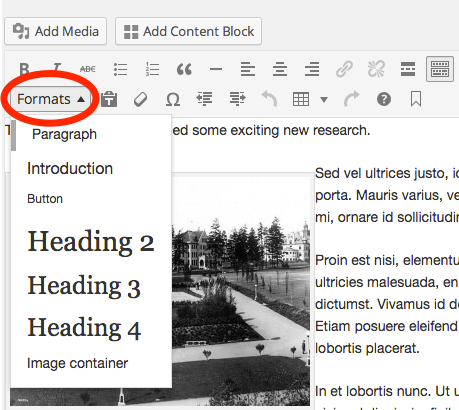 The introduction style is for introduction text at the top of the page, and the button style can be used to make text into a clickable button (just remember to add a link to that text as well). Hyperlinks are added by clicking on the hyperlink button. When adding links, please add a short, descriptive title in the field provided. Link titles are an important accessibility consideration for screenreaders. When in doubt, use the link text as the title. Please select “Opens in New Window” when linking to a page outside of your website. 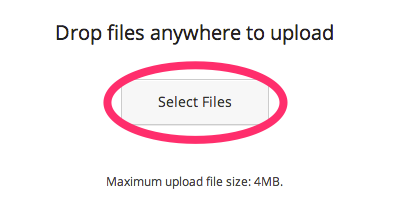 If uploading a new file click “Upload Files,” otherwise, select your image/file here in the Media Library and skip to step 4. Caption: For images only – a caption that goes under the image. Credit: Text that appears below the image showing its’ source. Image credits are required when using an image where someone outside your organization owns the copyright, unless the image is licensed for distribution without attribution. Credit URL: The link that the credit text will go to. Pictures: Choose Alignment: Right, Link to: Media File. These are our default settings, and if you want to change them, do so carefully. Files: Use default settings. Link to: Media File. If you want to edit a picture further, click on the picture and click the edit/pencil button. To delete, click “delete”. Content blocks are short pieces of content that can appear on different parts of your website than the main content area. Content blocks can be placed in sidebars, sections on the homepage, and as calls to action at the end of pages. Content blocks are placed in these sections using the WordPress widget system. To create or edit a content block, click on the “Content Blocks” tab on the left side of the Dashboard. Here you will see a list of content blocks. Click on any of their titles to edit them, or click “Add New” at the top of the page to create a new content block. Title: This title will appear above your content block, but it can also be disabled. Block Text: This is the main content area for the content block. This field should only contain text – Content block images should be added using the featured image field for the content block (see above). Links: Up to two links, added as buttons at the bottom of the content block. Content blocks are not displayed by default and must be paired with pages using the WordPress widget system. To position content blocks, click on Appearance, then Widgets. The sections on the right side are the different widget areas on the site. There are widget areas per each top level section, and before and after all body content. Drag the “Content Block” rectangle under the “Available Widgets” heading over to the right side section that you want the content block to appear on. Once the box is placed, you’ll see options to select which content block you want to use. Click save when you have finished configuring options – this will make the content block live on your site. Next to the save/update button is a visibility button that determines, with greater granularity, which pages your content block will show up on. Use this to have content blocks that only show up on specific pages or news items. You can also exclude content blocks from pages using this same tool. Site administrators can see additional settings that content editors cannot – these are found in the “Appearance” and “Settings” tabs on the left side of the WordPress administration interface. When misconfigured, some site settings can break your layout and alter site features. Please tread carefully within this section and only make changes if you’re sure you know what you’re doing. Contact our team if you have any questions. Widgets – this menu will help you add content blocks to the homepage and sidebar. Please contact us for more details. General – this section has settings for social media, your site description, name of your unit, and address. Writing – this part can set the default category for new posts. A default category must be selected. Reading – here you can change how many posts appear on the news page.